Love can be a terrible thing, as terrible as its absence. Continuing our monthly series of Asymptote Book Club interviews, Martin Aitken discusses his translation of Hanne Ørstavik’s Love. Jacob Silkstone (JS): Love strikes me as a book that changes tone dramatically when read for a second time. Apparently innocuous lines (“He thinks he’ll look out for her on the bus tomorrow,” for example) suddenly take on a tremendous amount of weight. Do you generally read a novel cover to cover before beginning a new translation, to get a sense of where the plot is heading, or do you start translating immediately? Martin Aitken (MA): This is a very short book, a novella, and every sentence in the Norwegian has been faceted very carefully indeed. The translator’s challenge is to poise the target-language sentences in the same way. I couldn’t envisage embarking on a novel like this without having read it first. I used to jump in at the deep end a lot, with crime fiction especially. There’s always a risk of being caught out by twists of plot when you do that, though of course rectifying mistakes is a lot easier these days than I imagine it used to be. However, with literary fiction I now prefer to spend time with the original before getting started on anything. With a novel like Love, so much of the work is about immersing yourself in the atmosphere of the piece, and I think the best way into that is to switch yourself off as a translator and just read. Getting the sense of the thing as a reader first, listening to its music as you move through the story, is a different thing entirely from the focus applied in crafting the translation. MA: The lyric you mention actually came astonishingly easily. I prepared the draft manuscript at a retreat for Danish writers on the Amalfi Coast in Italy, an old monastery where I came down with the flu and ran a temperature for two weeks straight. Maybe it helped. At any rate, I left the lyric alone when I came to it, but then sat myself down at the desk the same evening and just did it. Similarly in the case of a novel by Ida Jessen that I’ve recently completed, which Archipelago will be putting out later this year. It contains a marvelous poem from 1923 by the Nobel laureate Johannes V. Jensen, with metre and rhyme. To my knowledge, no English translation existed. That’s the kind of challenge that makes you break out in a cold sweat, fever or not. But again, for some reason I was able to produce what I think is a fairly decent rendition without too much bother. As for the Norwegian lomper, I did think of just leaving it there, italicised, which can be a perfectly valid strategy—I like the sound of the word, and of course it would lend a sense of strangeness to the text, a reminder that we’re in Norway and not Nebraska—but eventually I went with “flatbread wraps,” which is a bit explanatory, but still. I’m always wary of putting overtly British or American cultural markers into books set in Denmark or Norway. A word like “pub,” say, brings to mind something very British, for me at least, even if the word may have spread in recent years and become less culture-bound. Of course, sometimes there might not be an available alternative. JS: It seems possible to read Love almost as a morality tale, in which Vibeke makes a fatally flawed decision by privileging one kind of love over another. This is an odd question, but did translating the novel teach you anything at all about love (in whatever form)? MA: Love can be a terrible thing, as terrible as its absence. The choices we make in its name can be devastating. As you suggest, the novel is about different kinds of love—not least self-love, as quiet here as it is destructive. JS: “All plots tend to move deathward. This is the nature of plots,” as one of DeLillo’s characters puts it. But there’s a fairly widespread expectation that Scandinavian plots tend to “move deathward” even more frequently than most—when choosing which titles to translate, do you feel that there’s any pressure from publishers to conform (or refuse to conform) to the “Scandi noir” stereotype? MA: The whole wave of noir has obviously meant a lot of exposure for those writing in that genre, and more generally for the Scandinavian countries and cultures as well. At one point it felt like you could barely look at a British paper without falling over something about Denmark in particular, the Danish way of life—hygge, and the opposite, uhygge, which is the domain of those writers, some of whom, like Jo Nesbø from Norway and Jussi Adler-Olsen from Denmark, have sold a lot of books in English. But I think a side-effect of that is a more general interest from publishers in Scandinavian literary fiction. There are lots of intrepid publishers in the UK and the US in that respect, people like Maclehose, Fitzcarraldo, Peirene, Serpent’s Tail, Open Letter, Archipelago, Deep Vellum, to name but a few, all of whom are dedicated to putting out quality literature in translation. And in fact, the majority of enquiries I get from publishers are for literary fiction. JS: Love was published, to its fair share of critical acclaim, more than twenty years ago. Can you shed any light on why it took a full two decades to be translated into English? Would you say there’s a larger audience for contemporary Norwegian literature in translation now? MA: Maybe we needed noir to bring the key and open the door. I think certainly there’s more contemporary literature being published in translation now than there was twenty years ago, if only because the world is so much smaller now. In the sense that foreign cultures are nowhere near as foreign to us now as they were then, definitely not when it comes to our own western sphere. I left the UK in the mid-eighties, and apart from in London you practically never heard another European language. That’s all changed. I think we’re more open to the idea now that English isn’t all there is. And publishers like Jill Schoolman at Archipelago have been willing to take chances and show people there’s something out there that’s just as good and at least as interesting as what we know. As a footnote, I’ll add that it didn’t take me two decades to translate Love—but with any good book I’ve translated, particularly one as meticulous as Love, I’ve always wanted to keep working on it. At some point, though, there’s a deadline. 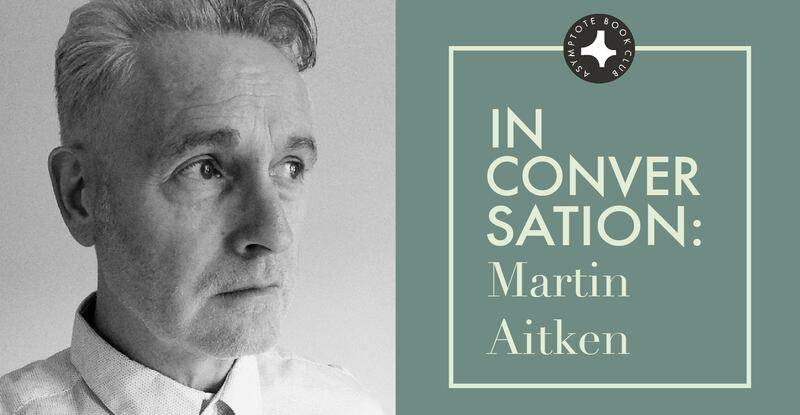 Martin Aitken is a full-time translator of Scandinavian literature. He has translated numerous novels, mostly from Danish. Love is his first book from Norwegian. Forthcoming in his translation are three books by Karl Ove Knausgaard, including the sixth and final volume of the author’s My Struggle, co-translated with Don Bartlett. Jacob Silkstone is an Assistant Managing Editor for Asymptote. He was previously Managing Editor of The Missing Slate (Pakistan), and has worked at international schools in Bangladesh and Norway.